Abd al Salam al Hilah. Image from The New York Times. Abd al Salam (whose internment serial number is 1463) has been held at Guantanamo since 2004. He compiled an extensive terrorist dossier prior to his detention. According to the newly leaked Gitmo file, he used his role as a PSO official to shuttle terrorists around the globe. While working for the PSO, Abd Al Salam was an active al Qaeda member who maintained ties to some of the most senior terrorists, including Ayman al Zawahiri. In August 2000, Abd al Salam flew to Rome, where he was met by Abd al Qadir al Sayed – a man who is described in the leaked Gitmo assessment as Osama bin Laden’s “ambassador” to Italy and the Egyptian Islamic Jihad’s “top document forger.” Italian authorities, who were already suspicious of Abd al Salam and Sayed, recorded a conversation between the two. Well, I am studying airplanes! If it is God’s will, I hope to bring you a window or a piece of a plane next time I see you. …We are focusing on the air alone. …It is something terrifying, something that moves from south to north and from east to west: the man who devised the program is a lunatic, but he is a genius. It will leave them stunned. … We can fight any force using candles and planes. They will not be able to halt us, not even with their heaviest weapons. We just have to strike at them, and hold our heads high. Remember, the danger at the airports. If it comes off, it will be reported in all the world’s papers. The Americans have come into Europe to weaken us, but our target is now the sky. Abd al Salam was visiting Milan’s Islamic Cultural Institute (ICI), a known hotbed for al Qaeda operatives, when he spoke these words. Gitmo analysts noted that members of the ICI contacted Sheikh Omar Abdel Rahman in the US “prior to the 1993 World Trade Center attack.” The leaked file does not contain any information of Abd al Salam’s putative ties to the World Trade Center bombing, although analysts concluded that he likely had foreknowledge of the attack. Italian and American officials concluded that Abd al Salam had foreknowledge of the Sept. 11 attacks, based on the recorded conversation excerpted above, as well as other evidence. Another of Hilah’s brothers, Nabil Ali al Hilah, traveled to Bosnia for jihad in the 1990s and was imprisoned in 1998 for his role in a car bombing in Mostar. Nabir Ali was closely affiliated with both the Cole bombers and the al Qaeda terrorists who failed in their attempt to attack the USS The Sullivans in early 2000. In 1997, US officials allege, Abd al Salam and Nabil Ali hosted a lunch at Abd al Salam’s house in Yemen. Their guests included Abd al Rahim al Nashiri, a top al Qaeda terrorist who masterminded the Cole bombing, and two of the suicide bombers who carried out the operation. Abd al Salam “likely facilitated” some of the Cole plotters’ “travel out of Yemen by providing them with passports,” the leaked Gitmo file reads. The leaked Gitmo file accurately describes the PSO as Yemen’s “primary state security apparatus, an independent agency which reports directly to” President Ali Abdullah Saleh. 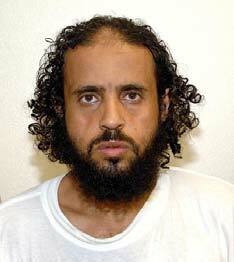 And Abd al Salam told US officials at Gitmo that the PSO was littered with al Qaeda sympathizers. For all of the above reasons, and more, US military officials consider Abd al Salam to be of “high intelligence value.” Abd al Salam stopped cooperating with interrogators at Gitmo in early 2005. But as of 2008, when the leaked intelligence assessment was written, officials still wanted to question him about the Sept. 11 attacks – as well as the ties between Yemeni government officials and al Qaeda. Sing little birdie, sing. If you want to do one thing right in life, tell us what you know so we can end this scourge of Islamic terror against innocent civilians and Muslims around the world. The “Revelations” like (“It is something terrifying, something that moves from south to north and from east to west”) Italian intercept to me (with no other data) sounds like more of a match to the Richard Reid style suicide shoebomber on an aircraft (“We can fight any force using candles and planes.”). Perhaps “candle” is a mistranslation or synonym for cigarette lighter (you know how flowery Arabic or how wacky translations can be). The shoe bombing op was meant to be the follow up to 9/11 but knowing about one doesn’t require knowing about the other. 52? Are they issuing a deck of cards with their photos? Why is this guy still alive? I hope Mr. al Hilah brought his swim trunks, cuz i’d say a little water-boarding is in order.